As the Rogue Valley’s wine scene expands, options for tourists and locals also grow. 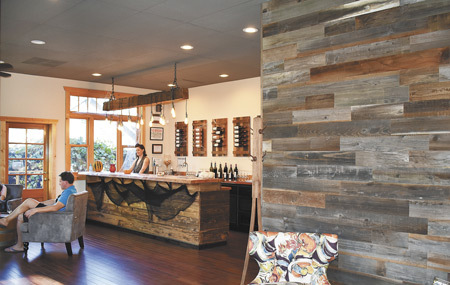 The following new tasting rooms offer a peek of the Valley’s many personalities in this most-southern of Oregon AVAs. Kathy and Tim O’Leary have farmed at the historic Valley View Orchard since 2000. 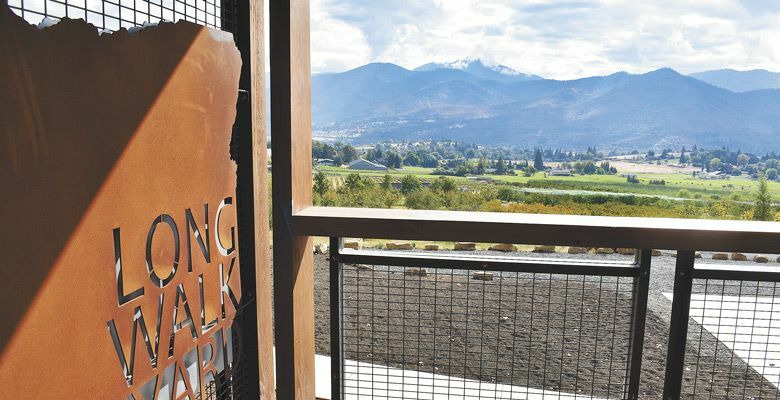 On the old farm packed with cherries, apples, peaches, nectarines, apricots and pears, plus an orchard store and buckets for U-pick, Long Walk Vineyard flourishes, and now a tasting room stands with spectacular views of the Rogue Valley and equally special wines. In 2002, the O’Learys found room among the fruit trees to plant 11 acres of the Châteauneuf-du-Pape grapes they loved: Mourvèdre, Syrah, Grenache, Cinsaut and Carignane, and Zinfandel, too. For many years, the crop was sold to a winery in the Willamette Valley. In 2010, the O’Learys were ready for change. 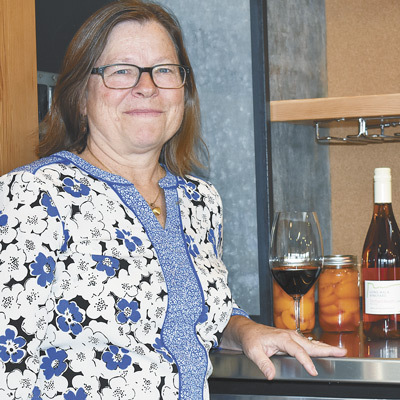 Linda Donovan of Pallet Wine Company in Medford began making Long Walk wines — Mourvèdre (both red and rosé), Zinfandel, Syrah and two blends: Orchard Red and a rosé named Orchard Bloom — from estate fruit. Since then, they’ve added Grenache and Carignane as additional single-varietal offerings. 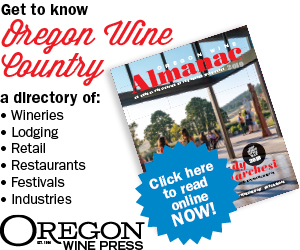 The grapes are certified organic by Oregon Tilth — as is the orchard — but the wines are not labeled as such because Pallet is not a certified organic producer. Then, a couple years ago, they spent time figuring out next steps. “We were trying to figure out what we wanted to be. Did we want to sell wine on site? Did we want to be big? Did we want to be small? We’ve always had customers come to our orchard store to taste and buy our wine, but it’s not an optimal wine tasting environment — no heat, no air conditioning, concrete floor, a utilitarian bathroom,” Kathy says. Thurs.–Sun., 11 a.m. to 4 p.m.
Daily, noon to 6 p.m. Wed.–Sun., noon to 6 p.m. The O’Leary’s enlisted the help of Laurence Ferar and Associates, a Portland architecture firm specializing in winery design, to help with a long-term site plan, including a tasting house. Kathy and Tim settled on an old wood shop they used for farm equipment and storage toward the top of the site. Just steps away from the orchard store, the spot had an incredible view, but the shallow, rocky soil in which the vines thrived made for a construction nightmare — they went through a dozen bits just trenching utilities. The O’Learys are working their land with a long-term commitment to sustainability, conservation and preservation. She holds dear the heritage of the orchard and Long Walk Vineyard, that lengthy trek from the old orchard store, down through the trees. Talent’s Trium Wine has a new owner, but he’s not really new to the brand. An Ashland native, longtime member of the Trium wine club and friends with former owner Laura Lotspeich, Tony Corallo has been in the institutional money management business in the San Francisco Bay Area for 27 years. He describes himself as an oenophile who’s always had a passion for wine. Corallo is continuing the brand with fruit from Lotspeich’s Pheasant Hill Vineyard, where Laura’s son, Dustin, continues managing the site first planted in 1990, as well as other local vineyards. Chris Graves at Naumes Crush & Fermentation is winemaker. In addition, Corallo recently opened Trium’s new tasting room. With comfortable seating inside and out, guests can taste the menu of wines and relax in the downtown Talent setting. Corallo will continue making Trium’s flagship wine, the Growers’ Cuvée, a blend Merlot, Cabernet Sauvignon and Cabernet Franc. Clea Arthur and Brian Denner opened Simple Machine’s tasting room in November 2017. 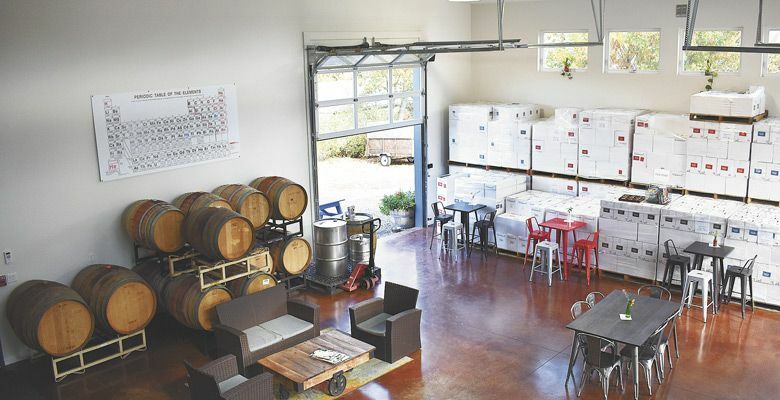 Located on Old Highway 99 in Talent, the Simple Machine tasting room is a 2,700-square-foot commercial building of shiny new aluminum with an expansive atrium and glass-paned retractable doors, inviting the outside in — especially on this glorious fall day. Barrels line the walls surrounding the comfortable seating, which is available outdoors, too. In true garagiste fashion, Denner crafts limited-production wines — Viognier, Sauvignon Blanc, Grenache and blends — in his own way, to satisfy his own palate and those who follow his winemaking path. He’s been making Simple Machine wines in Southern Oregon since 2010, and the brand reflects his natural, low-technology winemaking style. “He uses syphons and gravity to move wine around instead of pumps; it’s gentle winemaking,” explains Arthur. “Everything is on lees, so it’s all in the barrel; he doesn’t rack anything.” Rubber boots on, Denner even stomps his grapes, releasing only enough juice to cover the berries during fermentation. Arthur breaks away at this point to greet a helmeted and sprocket-shoed couple wheeling their bicycles into the tasting room. Simple machines seeking Simple Machine, what could be more appropriate?